Anyone offended by the prospect of drinking fine whiskey inside sealed space packs with straws after Suntory sent its finest variety to the ISS for testing? Don't worry: Ballantine's got your back. The liquor company has commissioned Open Space Agency's James Parr -- who also created a Lumia-powered 3D-printed telescope in the past -- to design a high-tech whiskey glass especially for zero-G environments. 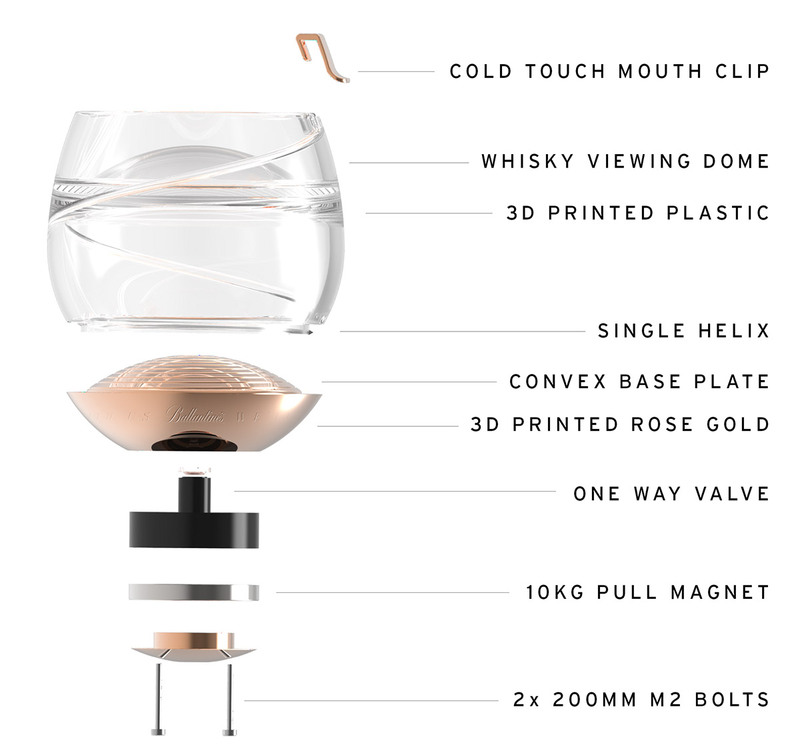 He tested a number of designs before settling on a rounded glass with a spiral convex stainless steel base plated in rose gold that can create the surface tension necessary to hold the liquor down. The liquid then passes through channels on the sides of the glass all the way up to the golden mouthpiece. The "glass" part itself is actually 3D-printed medical-grade PLA plastic, the same kind used for heart valves. Since everything tends to float in microgravity, the base hides a 22-pound magnet that can be used to stick the glass on magnetic surfaces. Plus, it has a one way valve where a customized whiskey bottle nozzle can be inserted to pour out a shot. Parr and Ballantine published more details about the design process on Medium, if you'd like to read more about how the "space glass" was created. Sure, it could be nothing but a marketing stunt, but it's amazing how much thought went into designing a whiskey glass. It's unfortunate that most of us might never get to use it in its intended environment; good thing the final product at least looks fancy enough to display.